The first stamps of Afghanistan are known as the Lion Stamps, after the lion’s head which appears in the centre of the stamps. The lion itself represents the ruler at that time Sher Ali, which translates from Dari as “Ali the Lion”. Being a strict Muslim country, an image of Sher Ali himself could not be allowed on the stamps (a human image did not appear on an Afghan stamp until 1937). 1288 First Issue, 3 values (shahi, sanar and abasi), 4 plates, each sheet 15 stamps. Plate A all shahi types; Plates B, C and D, composite. 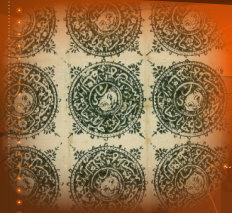 1289 2 values (6 shahi and 1 rupee), one composite sheet of four stamps. 1290 shahi value in sheet of 15 stamps. 1291 3 values (abasi, half rupee, rupee), one composite sheet of 15 stamps. 1292 2 values (sanar, abasi), one composite sheet of 15 stamps, but printed in two different colours: black and purple. 1293 “Post Office” issue, so-called because each post office used stamps of a different colour. 5 values (shahi, sanar, abasi, half rupee, rupee), two sheets each of 24 stamps, 1 sheet all shahi type, 1 sheet composite of the other values. Printed in 5 different colours. 1294 Second post office issue. Same values as 1293, but one composite sheet of 40 stamps. Printed in 4 different colours. 1295 Third post office issue. Same values as 1293, two sheets each of 40 stamps, 1 sheet all shahi type, 1 sheet composite of the other values. Printed in 4 different colours. 1295 “Skeleton” issue, so-called because the design is much simplified. Shahi value only, 1 sheet of 40 stamps, 4 different colours. So, if you want one of each position of each sheet, in each colour, that’s 1,112 Lion Stamps to hunt down. The stamps are sometimes wrongly described as Tiger heads. The mistake was first made by the early collectors, often ex-pat Britons in India, or on secondment to Afghanistan itself, who mis-translated “Sher Ali”, using Hindi (as spoken in India) rather than Dari (as spoken in Afghanistan). In Hindi “sher” means “tiger”; in Dari it means “lion”. The mistake was soon recognised and corrected, but even today it still crops up, though less and less frequently. The links in this Chapter are to pages showing examples of these fascinating issues.